In this still from a magneto-spin effect simulation of black holes, a spinning black hole produces a power jet (white-blue) along its spin axis. Near the center, the jet direction and rotational axis align with the spin axis, farther away the jet deviates to point along the rotational axis. The environment around a black hole is, literally, a hot mess. That mess makes a little more sense to scientists now, thanks to a new computer simulation that shows how the spin of a black hole can align with the doughnut of material orbiting it, as well as with the superfast jets that fly out of it. The key to it all, researchers found, is magnetic fields. Black holes essentially start out as spheres of mass with strong gravitational pulls. As gas, stars and other material fall into them, black holes can absorb not just the mass of the objects but their magnetic fields as well, becoming more and more magnetically charged. In cases where a black hole has acquired a very strong magnetic field, the simulation shows that the black hole's spin will twist space-time around it, causing the magnetic field lines to twist into spirals along the black hole's axis of rotation. 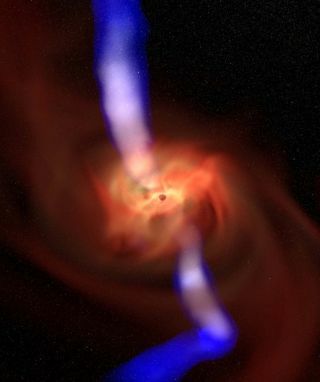 These twisted magnetic field lines produce jets of plasma (hot gas) that fly out from the black hole along its spin axis. The magnetic field also can affect the alignment of matter circling the black hole on its way down, matter that often takes the form of a thick doughnut-shaped accretion disk. This disk also will align with the orientation of the black hole's spin if the magnetic field is powerful enough. "Strong magnetic fields change the dynamics of the whole system, including the emerging jets," Tchekhovskoy told SPACE.com. "What's surprising is the whole system aligns together." The regions around black holes are very hard to observe with telescopes, but astronomers are getting closer and closer to being able to watch these systems. In September, a team of scientists led by Shep Doeleman of MIT's Haystack Observatory reported that they'd observed the mouth of a black hole for the first time, imaging closer than ever to a black hole itself by sighting the innermost matter orbiting it. "Our study is quite relevant to constructing models that are used to interpret that information," he said. The researchers report their new findings in the Nov. 16 issue of the journal Science.